I recently read an article that was written by Linda Van Slyke and shared by CarnivalWarehouseNews in regards to efforts being made toward ADA compliance. The Americans with Disabilities Act has been in existence since 1990 but in an industry that is centuries old change can come about slowly. It made me stop and think about how well Chance Rides is addressing these needs for our customers. Naturally, the best way for me to show you what Chance Rides is doing is by showing you what is currently in production. 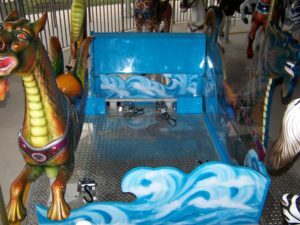 Carousels are part of the standard assortment of products that we produce every year. Because we make so many that serve so many customers it is important that they address ADA Compliance and give everyone an opportunity to enjoy them. 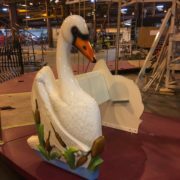 Here is an example of our Swan Chariot that has a flip up seat and floor latches to accommodate the whole wheelchair on the ride. We also specialize in people movers that can accommodate guests of all abilities. Out on the shop floor we have several Tramstars that are all equipped with wheelchair locks on the power unit. Again these include a fold down seat that provides additional capacity for when it is not needed for a wheelchair bound guest. 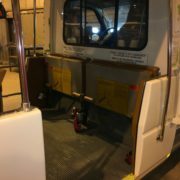 The Tramstar includes a pullout ramp so that the vehicle is easily accessible at any point on the trip, not just at the loading station. On my walk I spied another item in production that is sure to be inclusive for everyone. The beloved C.P. Huntington Train. Here you only see the production of our latest locomotive – 400 and counting! But our train coaches are able to accommodate wheelchairs as well. We also place the wheelchair accessible coach right behind the locomotive so that it is easy for the train engineer to offer assistance. 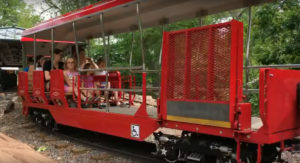 And like the Tramstar, the coach is equipped with its own retractable ramp making it accessible at all points of the journey. 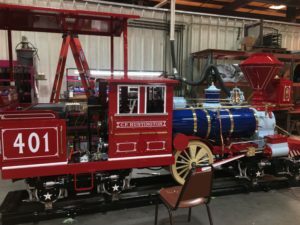 While we have a lot of examples in the factory, there is no better example of the strides we’ve made toward making amusements accessible than the products we manufactured for Morgan’s Wonderland in San Antonio, TX. 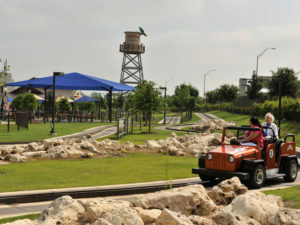 The entire park is designed to provide full wheelchair access for every attraction. We created special utility type vehicles for the electric car track that can accommodate a rider in a wheelchair. 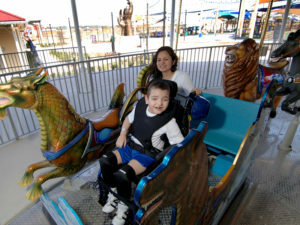 The carousel that was created for Morgan’s Wonderland even featured a specially designed chariot that would have the same movement as the other carousel horse so that children in wheelchairs would have the same experience as everyone else. 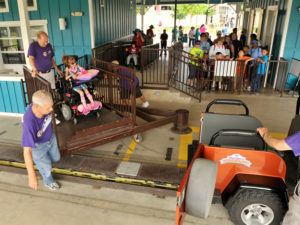 Many of the other rides we manufacture require transfer from the wheelchair in order to experience the ride. This is due to the nature of the safety requirements in our thrill rides. We do our best to make this process as accommodating as possible while still ensuring that all guests can experience the ride safely. And we are still always working on new ways to be an inclusive ride manufacturer. We look forward to future projects that drive us to get more creative with our accessible solutions.